Strengthen your brand and message, generate business leads, and gain access and exposure to thousands of parking and transportation professionals when you advertise with the International Parking & Mobility Institute (IPMI). 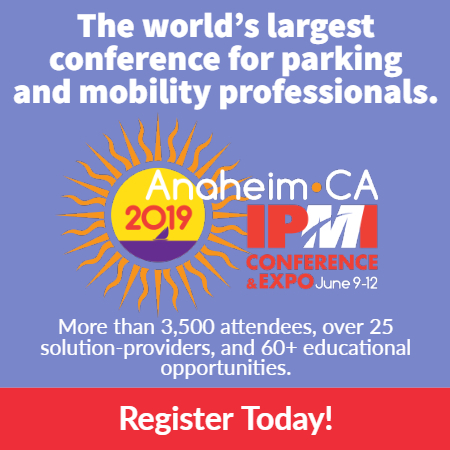 As the largest and leading association of parking and mobility professionals and the parking and mobility industry, IPMI is the best place to reach the parking, transportation, and mobility market. Parking executives, purchasing managers, and other key decision-makers in the parking and transportation industry consider IPMI the top source for industry news, trends, products, services, and more. Members know they will find unmatched education, training, and networking opportunities in the parking community, all backed by IPMI. On every platform and channel, IPMI reaches a large and diverse group of parking and transportation professionals. Choose from web, email, mobile, print, events, and more. The Parking Professional monthly magazine and The Parking Professional’s monthly digital notification emails. Industria del Estacionamiento, IPMI’s Spanish-language semi-annual magazine. IPMInsider, IPMI’s biweekly electronic newsletter. MovingForward, IPMI’s monthly professional development newsletter. When it comes to reaching engaged parking and transportation professionals, no other print publication approaches the quality and size of The Parking Professional’s audience. Studied by more than 8,000 industry professionals, The Parking Professional is available in print and digital formats and is archived on the IPMI website. The magazine is distributed throughout the U.S., Canada, and 30 foreign countries. A must-read publication for parking industry decision-makers and influencers, The Parking Professional educates, explores, and informs in an engaging and easy-to-navigate way. Packed with feature stories, case studies, new ideas, and expert insights, the magazine delivers the best journalism in the parking industry. Readers turn the pages of The Parking Professional looking for products and services that will help them do their jobs better, faster, and more economically. Get your company’s products and services in front of the parking industry’s decision-makers and influencers. Download the 2018 Editorial Calendar for upcoming advertising opportunities in The Parking Professional. The reinvented IPMI website is now an even better resource for our members and the parking community to find the latest on industry-specific topics and engage in a variety of different ways. It’s one of the first places parking professionals go to when they’re searching for practical information, proven tools, and innovative products and solutions. Industria del Estacionamiento, launched in January 2016, is IPMI’s Spanish-language magazine, bringing news, trends, case studies, and analysis to parking professionals with a focus on Mexico and Latin America. Subscriptions are free for members of IPMI and Asociación Mexicana de Estacionamientos, an IPMI affiliate, along with other parking professionals in Mexico and Latin America, with a large pass-along/secondary readership. Download the Industria del Estacionamiento Media Kit. Available in print, PDF, and online, the Buyers Guide & Consultants Directory is the “Yellow Pages” of the parking industry. The directory contains more than 90 pages of products and services available to the parking profession. The IPMInsider is IPMI’s biweekly electronic newsletter, providing parking and transportation professionals with the latest news and information about the parking industry. More than 9,000 subscribers keep up to date on membership news, industry events and trainings, jobs, RFPs, and more. Click here to learn more about advertising and sponsoring an IPMI event, including the annual IPMI Conference & Expo. Let IPMI help customize an advertising campaign for your organization with return on investment for many years to come. Download the IPMI Media Kit.